Cost : $285.00 + 50.00 core charge until we get back the old one. 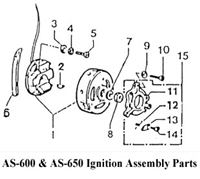 600 CDI Ignition parts no longer available. You can use the 650 ignition system.